The 75th Innovation Command (75th IC) is a separate command of the United States Army Reserve with the mission to "preparing to 'Make Ready' for the future" and drive operational innovation, concepts, and capabilities to enhance the readiness and lethality of the future force by leveraging the unique skills, agility, and private sector connectivity of America's Army Reserve. The 75th IC started as the 75th Infantry Division in World War II and was also active from 1952 to 1957 as a combat division of the United States Army Organized Reserves. In 1993, the division was reactivated as the 75th Division (Training Support) in the Army Reserve, which in later years became designated the 75th Training Command. In January 2003, numerous units of the 75th were mobilized to train other Army Reserve and National Guard units deploying overseas in support of Operation Iraqi Freedom/Operation Enduring Freedom (OIF/OEF). In January 2018, the 75th was reorganized into the 75th Innovation Command with its training divisions reassigned to the 84th Training Command. On 24 March, elements crossed the Rhine in the wake of the 30th and 79th Divisions. 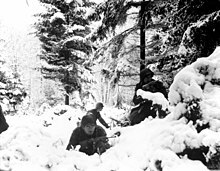 Pursuit of the enemy continued as the 75th cleared the Haard Forest, 1 April, crossed the Dortmund-Ems Canal on the 4th, and cleared the approaches to Dortmund, which fell to the 95th Division, 13 April. After taking Herdecke, 13 April, the division moved to Braumbauer for rest and rehabilitation, then took over security and military government duties in Westphalia. The father of Randy Pausch was wounded and received a Bronze Star during this time, as related in The Last Lecture. As of January 2018, this unit is designated as the 75th Innovation Command and all subordinate units are now assigned to the 84th Training Command. The only remaining organization in the US Army with the 75th designation is Headquarters and Headquarters Company, 75th Innovation Command, located at Ellington Field Joint Reserve Base in Houston, Texas. Prior to January 2018: The 75th Training Command (Mission Command) is separated into a Headquarters and Headquarters Company and five subordinate divisions, each of which is separated into three training brigades. The 75th Training Command (MC) and its subordinate divisions are the only entities that have the mission and capability to train reserve component forces in the full Mission Command Staff Training (MCST) continuum. The command executes MCST in all phases of the ARFORGEN culminating in the preparation of battalions, brigades and higher-level headquarters (HQs) for deployment in the available phase of the ARFORGEN rotation. ^ "About the Seabank Hotel". Seabank Hotel. Archived from the original on 9 August 2010. Retrieved 8 August 2010. ^ "Council Member Mike Sullivan's Newsletter" (PDF). City of Houston. August 2011. Retrieved 18 July 2012. This page was last edited on 24 February 2019, at 01:36 (UTC).